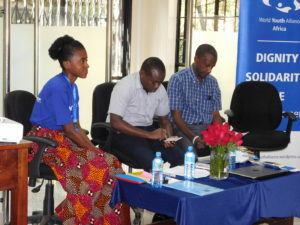 World Youth Alliance | WYA Africa holds successful FEMM Workshop themed, ‘FEMM for Everyone’ . WYA Africa holds successful FEMM Workshop themed, ‘FEMM for Everyone’ . 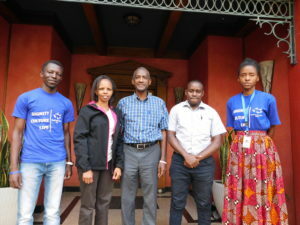 WYA Africa held a Fertility Education and Medical Management (FEMM) Workshop on January 27th (Saturday) at the Cara House, Karen, Nairobi, Kenya as part of their ongoing workshop series that begun in 2017. It was a wonderful and educational forum where young people came together to learn about FEMM, a sister organisation of the World Youth Alliance that presents a person centered approach to solutions for women’s reproductive and overall health. The event kicked off with registration undertaken by our current internship team followed by an introduction to WYA and FEMM by our RPA, Cynthia, and our Regional Director, Patricia. 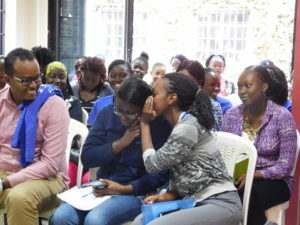 Our moderator, Wangeci Mwaniki, a WYA Africa Intern Alumna kept the sessions lively by engaging the audience in entertaining ice-breakers and ensuring that they had time to reflect on what they were learning during the day. The first guest speaker, Dr. Michael Kilonzi from Total Wellness International (ICAS Kenya), took us through Reproductive Health and Fertility. We then went through the Human Life Cycle where Dr. Wahome Ngare from the Kenya Christian Professionals Forum (KCPF) taught intensively about our human dignity and how we ought to uphold the value and worth of every human person. Gabrielle Jastrebski from the FEMM Health Organization took us through a very interesting and informative session via tele-conference, where she delved deeper into FEMM by enabling participants to understand why this is one of the best solutions today to ensure women and men receive adequate, complete, and relevant information that would allow them to better manage their health. She expounded on the hormone health connection that is often overlooked in our health today. But when well managed, it is easily understood and plays a critical role that can be enhanced through well-informed decisions on our health. She later tackled questions raised on contraceptives and their health implications. We also gave an overview of the ease and convenience of using FEMM and encouraged our participants to download the FEMM App. In addition FEMM offers, teacher training for those who are keen to learn more and to use it to impact the lives of others positively. There is also the medical management training for medical practitioners who are interested to use the FEMM protocols to assist women to better manage their health. For those who are keen to be guided on FEMM and how to use it to track their health, there are teachers in our directory here that are accessible. Our gratitude goes out to all who attended and who made this day a success, especially Total Wellness International (ICAS Kenya) through Selina Kemama for their partnership. We look forward to the FEMM Open Day in June 2018, where we shall engage more.